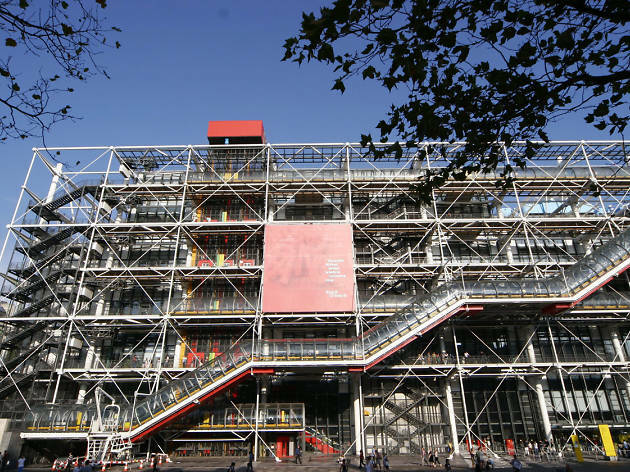 The primary colours, exposed pipes and air ducts make the Centre Pompidou one of the best-known sights in Paris. The then-unknown Italo-British architectural duo of Renzo Piano and Richard Rogers won the competition with their 'inside-out' boilerhouse approach, which put air-conditioning, pipes, lifts and the escalators on the outside, leaving an adaptable space within. The multi-disciplinary concept of modern art museum (the most important in Europe), library, exhibition and performance spaces, and repertory cinema was also revolutionary. When the centre opened in 1977, its success exceeded all expectations. After a two-year revamp, the centre reopened in 2000 with an enlarged museum, renewed performance spaces, vista-rich Georges restaurant and a mission to get back to the stimulating interdisciplinary mix of old. Entrance to the forum is free (as is the library, which has a separate entrance), but you now have to pay to go up the escalators. The Centre Pompidou (or 'Beaubourg') holds the largest collection of modern art in Europe, rivalled only in its breadth and quality by MoMA in New York. Sample the contents of its vaults (50,000 works of art by 5,000 artists) on the website, as only a fraction - about 600 works - can be seen for real at any one time. There is a partial rehang each year. For the main collection, buy tickets on the ground floor and take the escalators to level four for post-1960s art. Level five spans 1905 to 1960. There are four temporary exhibition spaces on each of these two levels (included in the ticket). Main temporary exhibitions take place on the ground floor, in gallery two on level six, in the south gallery, level one and in the new Espace 315, which is devoted to artists aged under 40. On level five, the historic section takes a chronological sweep through the history of modern art, via Primitivism, Fauvism, Cubism, Dadaism and Surrealism up to American Color-Field painting and Abstract Expressionism. Masterful ensembles let you see the span of Matisse's career on canvas and in bronze, the variety of Picasso's invention, and the development of cubic orphism by Sonia and Robert Delaunay. Others on the hits list include Braque, Duchamp, Mondrian, Malevich, Kandinsky, Dalí, Giacometti, Ernst, Miró, Calder, Magritte, Rothko and Pollock. Don't miss the reconstruction of a wall of André Breton's studio, combining the tribal art, folk art, flea-market finds and drawings by fellow artists that the Surrealist artist and theorist had amassed. The photography collection also has an impressive roll call, including Brassaï, Kertész, Man Ray, Cartier-Bresson and Doisneau. Level four houses post-'60s art. Its thematic rooms concentrate on the career of one artist or focus on movements such as Anti-form or arte povera. Recent acquisitions line the central corridor, and at the far end you can find architecture and design. Video art and installations by the likes of Mathieu Mercier and Dominique Gonzalez-Foerster are in a room devoted to nouvelle création. Also attached to the museum is the Atelier Brancusi, a replica of the atelier where Romanian sculptor Constantin Brancusi worked in Montparnasse at the beginning of the 20th-century. There is never a bad exhibition on at the Pompidou and it does the 'slash' status really well (museum/gallery/cinema/shop). It's a shame you have to enter the museum to get to the shop though, it's a bookworm's heaven and sells far more than just art books. If you only do one museum when you're in Paris, make it the Pompidou - especially for the architecture. 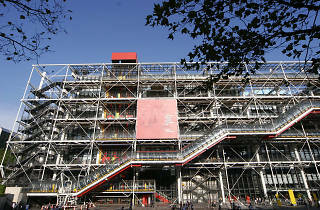 The Centre Pompidou is my favourite among the "big museums" in Paris. The building itself worth the visit, and the views from the top. Art you can find is less conventional, including top painters like Dali or Picasso. I love this Art Museum. Every thing was designed with the viewers in mind. The outside design flows nicely with not only the tangible design but the modern content of the pieces. I met Roy Lichtenstein in college and where his pieces are my heart is there. He was such a humble man with a gentle smile. I plan on visiting again maybe with art students. Thank you for the wonderful work.